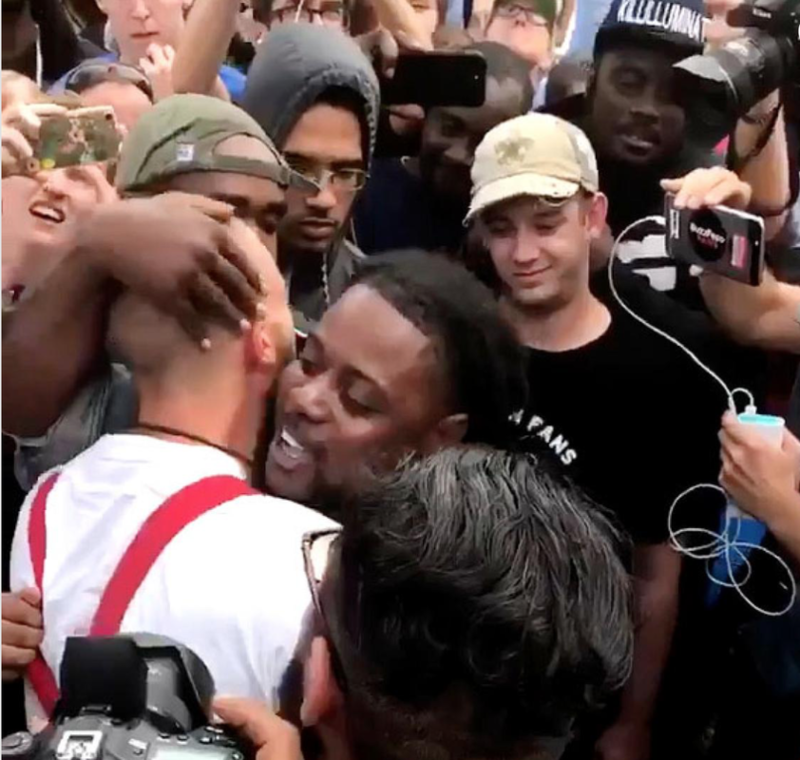 A man wearing a T-shirt emblazoned with swastikas on Thursday was surrounded by a crowd of protesters who screamed, punched and spat on him before Aaron Courtney gave him a hug. Courtney, a 31-year-old high school football coach in Gainesville, yelled, “Why don’t you like me, dog?” as he wrapped his arms around the Nazi in a video that quickly went viral on social media. The Nazi was later identified as Randy Furniss. Courtney said he didn’t know who Richard Spencer was when he received a state of emergency notification on his phone on Monday. Florida Gov. Rick Scott declared the emergency ahead of Spencer’s appearance at the school just two months after the white supremacist helped plan a far-right rally in Charlottesville, Va., that broke out in deadly violence. Surprised that the emergency declaration wasn’t warning of a kidnapping or an impending hurricane, Courtney set out to do some research on Spencer. “I found out about what kind of person he was and that encouraged me, as an African-American, to come out and protest. Because this is what we’re trying to avoid. It’s people like him who are increasing the distance ... between people,” he said. Courtney, who spent nearly four hours protesting that day, was getting ready to leave when he saw Furniss causing a commotion among the other demonstrators. “I had the opportunity to talk to someone who hates my guts and I wanted to know why. During our conversation, I asked him, ‘Why do you hate me? What is it about me? Is it my skin color? My history? My dreadlocks?’” he told the Daily News.